At Stem Cell Treatment Institute we support the use of advanced products to improve health, prevent disease and help you live longer. One of the keys to healthy aging and disease prevention is maintaining key levels of certain nutrients and introducing certain supplements which have been shown to improve your immune system, fight disease and slow the aging process. Stem cells must have growth and immune factors (IGF-1, IGF2 etc) in order to be effectively stimulated and for this activation to be sustained so your stem cells are abundantly released and multiplied. An immunity support spray that instantly delivers natural, immune health-supporting compounds like zinc, echinacea and bovine colostrum. Bovine Colostrum contains twenty one times more growth and immune factors than human colostrum. Colostrum is rich in proteins including immune properties such as immunoglobulins, proline-rich polypeptides, and lactoferrin to build your body’s defense against foreign invaders. Proline-rich polypeptides help maintain a balanced immune system. Colostrum stimulates granulocyte colony stimulating factor (GCSF). GCSF boosts the levels of a person’s hematopoietic stem cells which create all blood cells. They are found in the peripheral blood and the bone marrow. 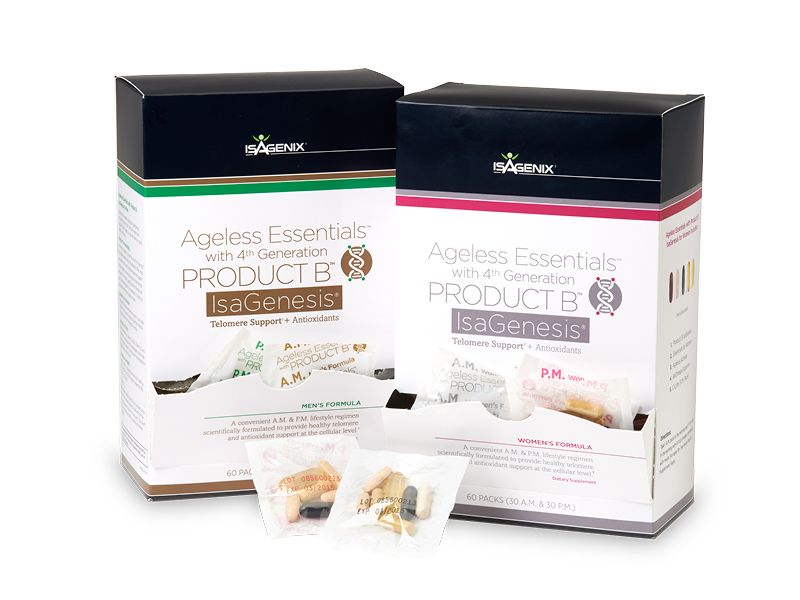 Isagenix® has developed Ageless Essentials with Product B IsaGenesis to give you a convenient way to achieve optimal intakes of vitamins, minerals, omega-3s and antioxidants, as well as special age-defying nutrients in easy to use packets to meet your nutritional needs. Product B IsaGenesis features improved absorbability so that your body can effectively use the nutrients for superior antioxidant and telomere support in cells where they’re needed. 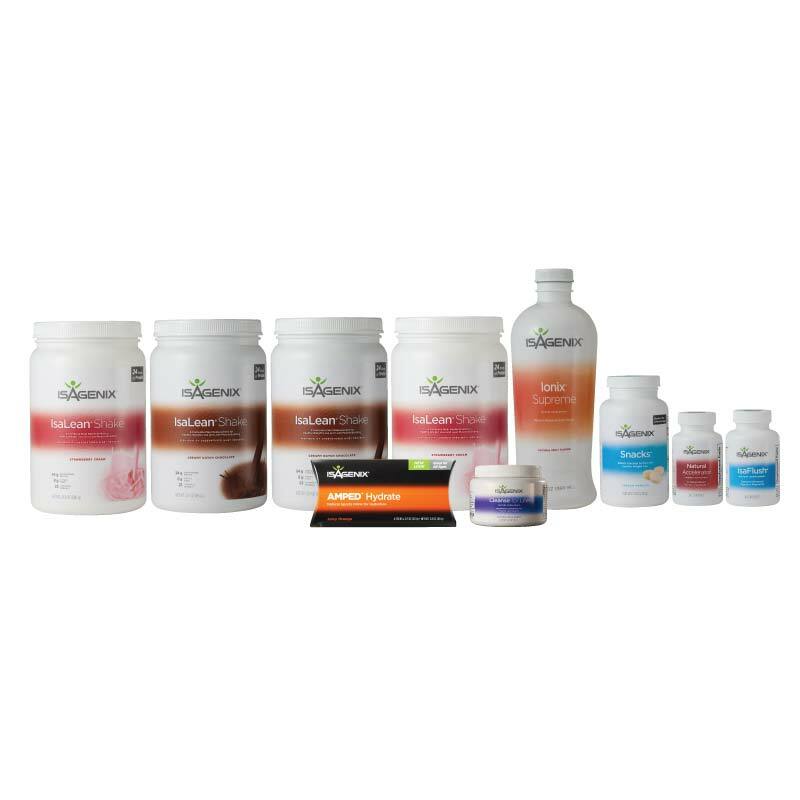 This cleansing and fat burning “starter pak” is ideal for those individuals who want to lose weight using a long-term, flexible program.